Place unpeeled chayotes in a saucepan, cover with water, bring to a boil and cover the pan, then reduce heat to low; simmer for 25 to 30 minutes until the chayotes are cooked through. A knife will cleanly go through them, but they won’t be completely soft or mushy. Drain, and once cool, peel the chayotes. Cut them in half, then slice into sticks. Combine the remaining ingredients, except for the onions, and whisk into a vinaigrette. Add the onions, mix well and let it sit for 5 to 10 minutes. It can also be made ahead a day before and left in the refrigerator. 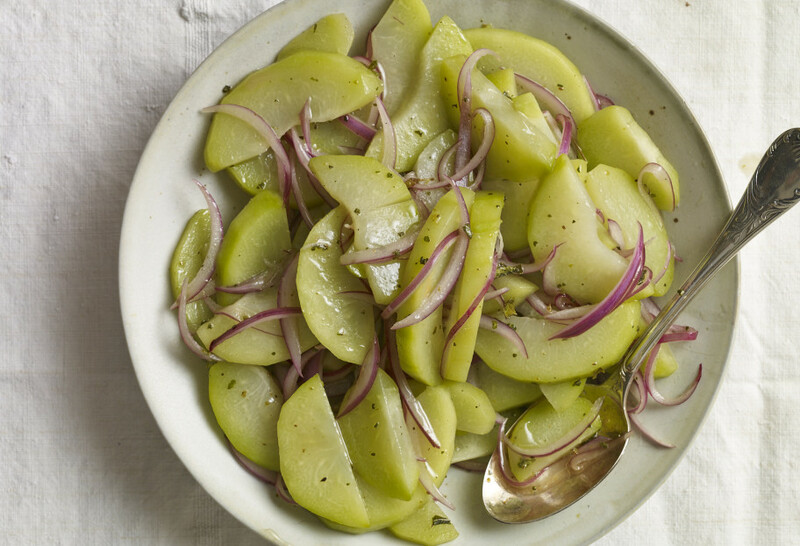 Toss the chayote sticks with the vinaigrette and onions. Serve or cover and refrigerate for up to 12 hours. I’d never made a chayote squash before this recipe! There’s only two places in my city where I can find them, too. This salad is delicious! I could eat it everyday. Thank you, Pati! So happy you discovered chayote squash and enjoyed the salad, Krista. Krista – In the deep south chayote squash goes by the name mirliton. It’s like the squash of New Orleans. Shrimp stuffed mirliton is a very popular dish there.